“Many capitals in the Islamic world throughout Africa and Asia would have been happy to have been chosen by Obama,” declared Osama Saraya, editor-in-chief, in Sunday’s Al-Ahram newspaper. So, as small a gesture as it may seem, President Obama has given a gift to Egypt’s President Hosni Mubark just by heading there next month to give an address aimed at the Islamic world. The problem with this is that Mubarak has been criticized by many in the West for his human rights abuses and his poor record of allowing democracy. On the other hand, Egypt has recognized Israel and been a thorn in the side of Iran. But almost all the Arab and Islamic countries from Egypt to the Persian Gulf are worried about Iran, except maybe Syria and many in Lebanon. 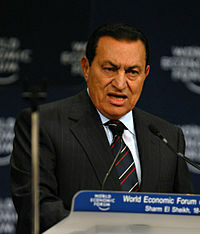 You are currently browsing the archives for the Mubarak category.